The ultimate cure for writer's block? Forget any images of creative writing groups on metal chairs in draughty community centres, the business of learning to write has developed into something much more lavish. On a summer's evening, beside the River Seine, outside a beautifully idiosyncratic bookshop, a current crop of American creative writing students are listening to readings. These students from New York University (NYU) are in Paris for a month as part of their studies - immersing themselves in the literary culture of the French capital. Accompanied by their teaching staff, the students use the city as a giant writing workshop. The cafes, art galleries, the readings and the Parisian streets become the material for their exercises in fiction and poetry. It must be the most de-luxe cure for writers' block, while still racking up credits towards a degree. It's such an idyllic setting, listening to readings and discussions, in the shadow of Notre Dame, outside the classic Shakespeare and Company shop-front, that the only natural reaction is one of overwhelming jealousy. It's not only NYU which brings its students here. There are other universities and institutions, from the US, the UK and Australia. The Left Bank is becoming a field-trip centre for trainee bohemians. It's also a reflection of how higher education - costing up to $50,000 (£32,000) per year in the US - has become about experiences as much as qualifications. But what difference does this kind of Parisian trip make to their writing? "It's good to escape the familiar. You see the world fresh, often with intense clarity," says Deborah Landau, an award-winning poet and director of NYU's creative writing programme. "Paris has always been a city for writers; generations of novelists and poets have flocked to Paris seeking inspiration and literary camaraderie." And she says the students can be inspired by the "sensory pleasures" of the city - whether it's the food, wine, art, music or the small bookstores. "Lingering over coffee for hours in the cafes is absolutely encouraged." Students also have a line-up of novelists and poets to act as tutors. The university has added a "low residency" postgraduate course - taught in intensive blocks rather than full terms. This includes five 10-day stretches in Paris - and novelist Helen Schulman says this is where it can really make a difference for students. "They're on a different hamster wheel, they're so outside of their lives. They're away from their work, their families, all the things that press upon them, they get a chance to follow their dream of writing. And for a grown-up, it's a way of doing that without leaving their job or losing their family," she says. Young writers coming to Paris follow in the footsteps of the likes of James Joyce, Ernest Hemingway, Francis Scott Fitzgerald and Samuel Beckett. 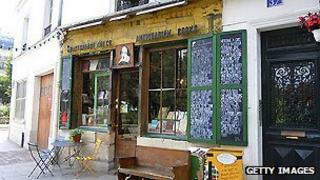 And the Shakespeare and Company bookshop used by the NYU students is a living link to that legacy. This current shop in the Latin Quarter is the second incarnation. The first was run by Sylvia Beach, a US-born bookseller who published Ulysses by James Joyce in 1922 - when more or less everyone else had turned it down. This was the hang-out for writers such as Hemingway and Fitzgerald, before it was shut down during the Nazi occupation. When Sylvia Beach died, the name of the shop and its commitment to writers was taken over in the 1950s by another American bookseller in Paris, George Whitman. It's now run by his daughter, Sylvia Whitman, the inheritor of the kind of ramshackle bookshop that is so photogenic that you would want to use it as a movie set. In fact, Woody Allen did just that, using the shop, with its overflowing bookshelves, in his own cinematic tribute to literary ghosts, Midnight in Paris. The dog-eared hardbacks in the shop's library include copies that used to be owned by the likes of Graham Greene and Jean Paul Sartre. It's not all show. Young writers can stay here for free - and thousands have done so over the decades. "We try to support them, give them a bed and some food, to be a home away from home. "We could commercialise, but there are more important things," says Sylvia Whitman, who herself has something of a pre-war spectral look. The previous Shakespeare and Company was closed down because Sylvia Beach refused to sell her last copy of Finnegan's Wake to a German officer. And you get the impression that any other intruding official would still get the same treatment today. The idea of bringing students to Paris also reflects the competition between the ever-growing number of creative writing courses. And it means balancing the literary themes with the literary theme park. In the UK alone, there are now more than 700 different creative writing degrees on offer, often in combination with other subjects, including accounting and creative writing, human bioscience and creative writing and creative writing and sports management. For many years, almost the only place in the UK offering a creative writing degree was the University of East Anglia, which began teaching the subject in 1970. The university's current director of creative writing, novelist Andrew Cowan, says that from relative rarity, the subject has spread rapidly in the past 15 years. Among the reasons he suggests is that English literature degrees had become so abstruse and theoretical that creative writing allowed students to return to talking about authors and books. "Creative writing puts the author back in the centre of the picture." The place of creative writing has now been established within the publishing industry, he says. Literary agents and publishers are waiting at the end of the graduate conveyor belt. It's hard to imagine an author like Hemingway fitting into that world. But he probably provided the set text for what the would-be student writers take away from Paris.